People babble about mining asteroids, but I don't see how it could possibly be cost-effective. Could it be? Nickel-iron meteorites contain Cobalt, Germanium, Gallium and Iridium. If those could be extracted on site, then an asteoid source might be more viable. It probably could be if we focused on rare earths and other intrinsically valuable elements, and developed the technology to extract and refine it in place robotically. I don't see it being cost effective at any time in the next few decades, possibly longer. If you just want to have some mined elements on paper, it will not be cost effective. If you want to have some materials specifically in space for some purpose, nature is giving you a $2000 to $20000 per kg subsidy from the fact that the asteroid is already in space. That's what will drive it to be cost effective. You don't have to mine asteroids cheaper than mining on earth. You just have to mine asteroids cheaper than building rockets to throw ore into space. If you're thinking about selling asteroid ore on earth, don't bother. Those reentry flames won't just be burning off the ablator, they'll be burning off 99.99% of the intrinsic value (the kinetic energy!) of your materials. Are the masses of Hayabusa2 and Ryugu too small to allow H2 to be in an orbit of its target? Or is the probe just coasting/manoeuvring alongside, with both in orbit around the sun? Figuring out the value of asteroidal materials to Earth-based industries is not likely to strongly suggest profit. Asteroid mining will be useful and profitable (if anyone cares) when a significant number of us have reason to live and work in space. 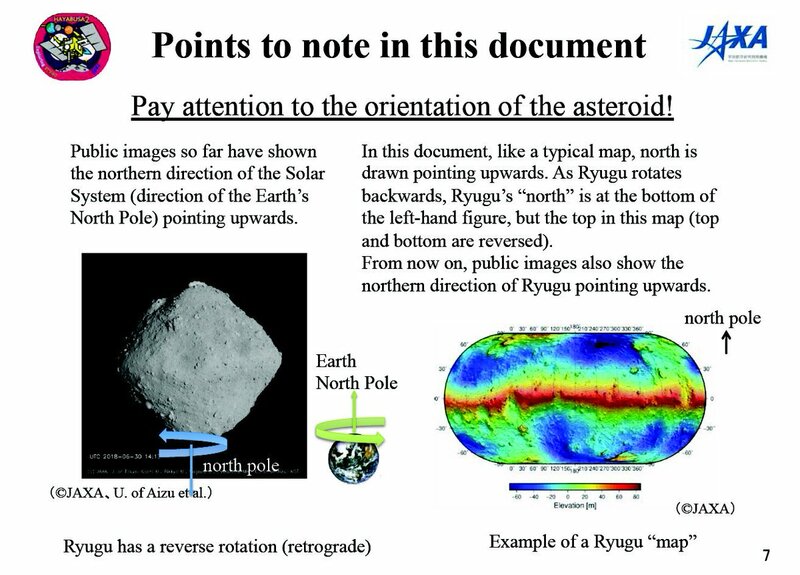 Are the masses of Hayabusa2 and Ryugu too small to allow H2 to be in an orbit of its target? Or is the probe just coasting/manoeuvring alongside, with both in orbit around the sun? A close orbit around any solid body generally takes around 2 or 3 hours. That amounts to Ryugu orbital & escape velocities on the order of ~1 km/hr. a Ryugu in full solar illumination and not bother to reorient either H2's cameras or solar panels. Just semantics, but it seems odd to say the Hayabusa2 is hovering when it has an orbital speed of something like 60,000 mph. More like it is orbiting (flying?) in formation with Ryugu. Just semantics, but it seems odd to say the Hayabusa2 is hovering when it has an orbital speed of something like 60,000 mph. More like it is orbiting (flying?) in formation with Ryugu. hover (v.) c. 1400, hoveren, frequentative of hoven "hover, tarry, linger;" see hove (v.1). As a noun from 1510s. hove (v.1) mid-13c., of birds, "remain suspended in air;" also generally, "to float, rise to the surface;" from c. 1300 as "wait in readiness or expectation;" late 14c. as "loom protectively over," also figurative, of unknown origin. In Middle English often of ships at anchor, standing off a coast. Common 13c.-16c., then superseded by its derivative, hover (v.). Wouldn't mining the Moon be less expensive than mining asteroids? It's been collecting ground up asteroid material all over it's surface for 4 billion years, it's always just over there, and there's no chance of it hitting us if something goes wrong. As a rule, the more diffuse and mixed the ore, the more expensive it is to obtain the desired elements. It may be a problem for many asteroids that there are fewer mechanisms to concentrate elements and minerals. But getting stuff from moondust is about the same problem as getting it from our own oceans (which have pretty much everything dissolved in them, e.g. 10 g/km3 gold in seawater). I wasn't talking about the mass of material. But the cost & value of it. The ratio of $/kg for mass in orbit vs $/kg of raw ore shows that basically all the value is in its kinetic energy and the fact it is in orbit, not its mundane metal content.